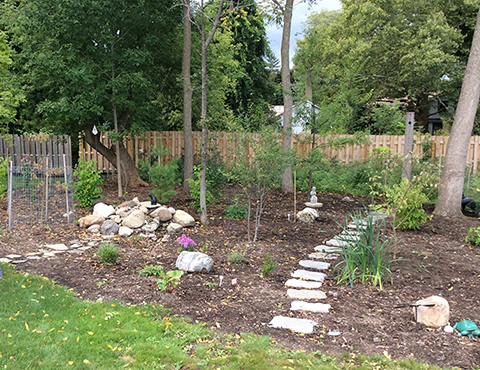 This habitat garden involved a brand new house on a new lot. The back of the lot was overgrown with invasive brush and vines and had been used as a dumping ground for all kinds of debris. I had installed a habitat garden on my clients previous property and they asked me to help them out on their new home. 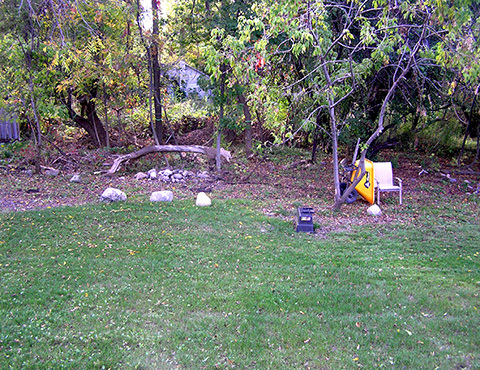 They had moved from a wooded lot with lots of birds and wildlife to this one that was devoid of both trees and birds. How to create a haven for birds in this new space? The goal is to turn the back portion of the yard into a bird habitat that will attract and hold birds. The few trees that were worth saving were preserved and all of the exotic invasive plants were cut and removed. The site is poorly drained so species adpated to these conditions would be used. All of the brush, debris and vines were removed, paving the way for the new plants. During the installation of plants in the fall. A large number of tree, shrub and perennial species were chosen to provide a diversity of food resources throughout the year for the resident birds. 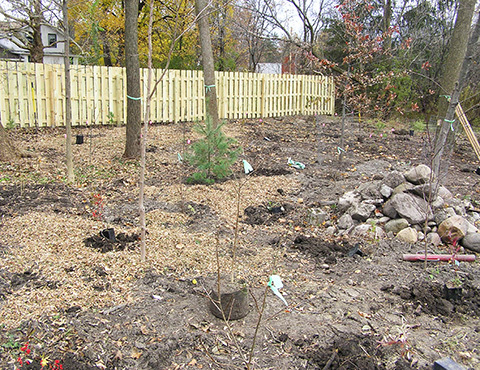 A few larger Sugar maple, a Pin oak and American hornbeam were installed to help develop the tree canopy. Most of the plants were planted as small containers to minimize cost and maximize the number of plants that could be used. In the beginning there is a lot of space between the plants but in just a few years as the plants grow the spaces will dissapear and the habitat will flourish. Large stones that were left on site were used to create architectural interest as well as serving as over wintering sites for amphibian. A pathway was laid using salvaged pavers that invites one to enter the space. 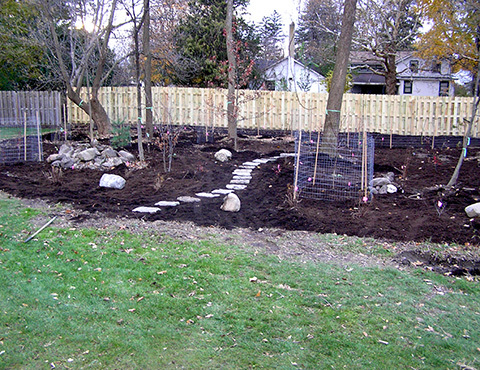 Finished garden with plants installed and mulched, just waiting for the birds to come. 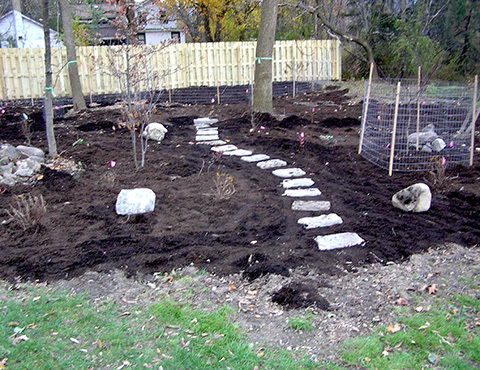 An extensive list of shrub and perennial species were installed that will create the kind of dense cover that birds require. The native shrubs are also some of the most ornamental plants you can use in a landscape. Tree species: Sugar maple. Pin oak, American hornbeam , Swamp white oak, Bur oak, Yellow birch, White pine, Tulip tree, American elm. The first growing season, the plants have leafed out and are getting their roots established.